Photo ID required. No charge. Viewable 9 a.m. to 5 p.m. Monday through Friday; closed weekends and holidays. Participate in a live Twitter Q&A with David Maisel on January 8 from 3 p.m. to 4 p.m. EST. Read more. The photographs in this exhibition are derived from x-rays of classical sculptures from the Getty Center, Los Angeles and the Asian Art Museum of San Francisco. David Maisel began this series during a 2007 residency at the Getty Research Institute. 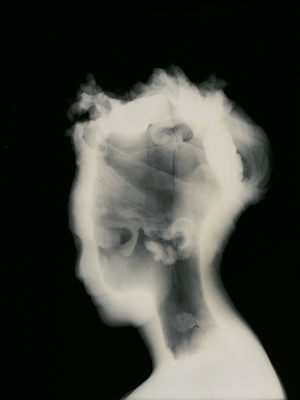 Originally used for conservation purposes, Maisel invites us to consider the aesthetics of the x-ray itself. To create these pictures, he re-photographed the x-rays on a light box, scanning and extensively manipulating the resulting images, bringing forth colors that reference cyanotypes, albumen prints, and other 19th-century photographic processes. Maisel’s earlier projects include Black Maps in which he took aerial photographs of environmentally impacted sites, and Library of Dust, in which he catalogued individual copper canisters, each containing the cremated remains of patients who had died at a psychiatric hospital. WithHistory’s Shadow, he continues his inquiry into the intertwined themes of memory and excavation. David Maisel is the recipient of a 2007 Scholar/Artist Residency from the Getty Research Institute and a 2008 Artist Residency from the Headlands Center for the Arts. Maisel has received fellowships from the National Endowment for the Arts and the Opsis Foundation, and was a finalist in 2008 for both the Alpert Award in the Visual Arts and the Prix Pictet in Photography. His work is included in major public and private collections, including the Metropolitan Museum of Art, New York, the Museum of Fine Arts Houston, and the Los Angeles County Museum of Art.